Do you lead a healthy lifestyle and love being active? A career in Fitness may be the perfect career choice for you. A career in the Fitness industry can often be flexible, but it’s important that you can be self-motivated and organised. You also need to have good people skills, as you will work closely with a mix of clients on a daily basis. 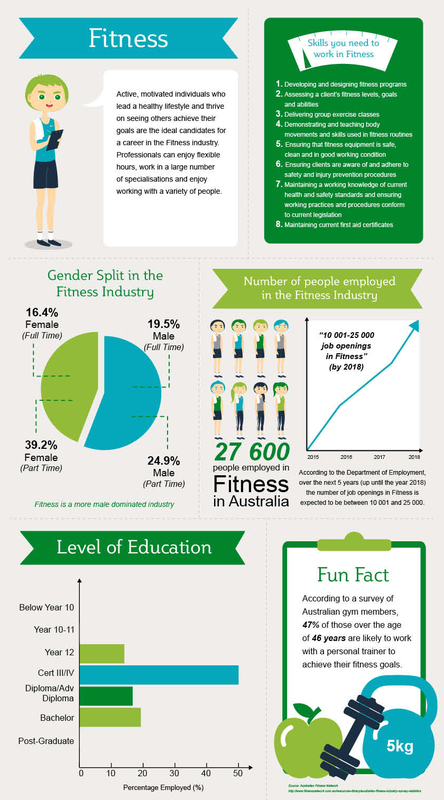 Across Australia, there are currently around 27,600 people employed within the Fitness industry, with this figure set to increase by 2018. So if you’re interested, now is a great time to start, whether you’re looking to be a Fitness Instructor or Personal Trainer. A career in the Fitness industry can be extremely rewarding, as you get to see people achieve their goals through your ongoing help and support. Applying for roles in the Fitness industry? Learn how to formalise your qualifications and skills with our handy visual guide.